Two exchange students arrived at Blackville School from Korea this month. 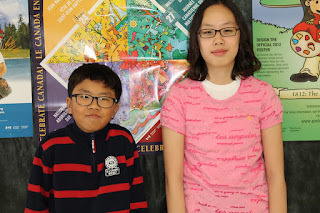 Jin Seok Kim and Su Gyung Park are both grade six students and will be here until February 28. The Korean students came to the area to experience the rural and country environment. Over the years the school has hosted many international exchange students. The two host families this year are Brian and Denise Kelly and Dana and Quentin Campbell. Both Kim and Park came to Canada to study English, and said their favorite subjects are Math with Mrs. Carmel Fiander. Park said she enjoys her host family and friends and enjoys gym class. Kim enjoys the snow in Canada and the people; he also said he really enjoys gym class. The goal of bringing exchange students to Blackville is for the students to see what another culture is like and for them to help the exchange students learn all about the school and community of Blackville.